Oh, I had so many plans for this week. Posts to write, plants to tend, gardens to weed and plant, birthday parties to plan. Instead, I've spent the last three days at home with a sick boy. Since Monday, we've watched 36 episodes of the old show "Tin Tin" on Netflix. I have no idea how this marathon began. I know you all want to award me "Mother of the Year" for my fine parenting skills. And it looks like tomorrow we'll be doing more of the same. To top it off, my girlie is sad. For months, she counted the days until March 28--the day our local feed and seed was scheduled to receive its shipment of chicks. 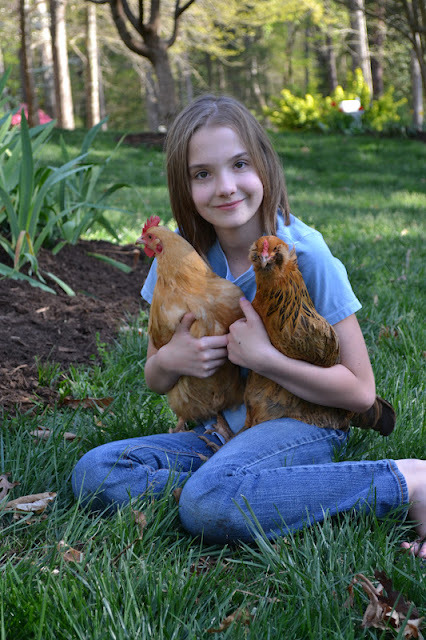 There's a Barred Plymouth Rock she's coveting, and in another shipment next week--two Golden Campines. The brooder is up, the heat lamp is on. (You know, the lamp must be on for 24-hours prior to the peep's arrival to achieve the proper temperature, says Chicken Mama.) The feed is in the dish. After three calls to the store, we found that the chicks will arrive tomorrow. So, to celebrate the impending arrival of our new peeps, I thought I'd share some photos of Chicken Mama and two of her girls. Oreo decided that Kristen is a good pillow.